As DIY enthusiasts, we know that a home workshop needs a lot of tools. One of the essentials is the pillar drill, a machine that allows the drilling of perfect holes in various materials, such as wood, plastic, or even metal. There are dozens of products out there, from low-end models with few settings to professional units with multiple gears, improved safety features and unparalleled performance. Identifying the best unit for the hobbyist craftsman or professional tradesman is often confusing and exhausting. Yet, you needn’t worry! Our DIY experts have discovered the most promising pillar drills for personal use on the market, tested and rated them. Check out our top picks below. How Does a Pillar Drill Work? What Can (And Can’t) A Pillar Drill Cut Through? Perfect machine for those who don’t want to compromise on performance. Powered by a 710W motor and very comfortable to use. A compact bench drill powerful enough to cut through wood, plastic, and metal. Ideal for the budget-conscious hobbyist. 13mm capacity and variable speeds between 580rpm and 2650rpm. Easy to operate and comes with a 3 year warranty. Best suited to DIY enthusiasts rather than professionals, but still a valid option. Compact unit with a robust cast base – suited to those who have a smaller bench to work with. Has five speeds and a 13mm capacity chuck. Probably best for light-duty purposes. A larger unit for bigger workspaces. Five speed settings up to a max 2650rpm & includes a 2½” all steel engineer’s vice. Comes with a 2 year warranty. Bosch PBD 40 is the perfect tool for the hobbyist or tradesperson who doesn’t want to compromise on performance. Our top pick and one of the best-selling machines in its range, PBD 40 is powered by a 710W motor and is comfortable to use, while the lack of play in the chuck and the two gears deliver an unparalleled drilling precision. The speeds between 200 and 850rpm in first gear or 600 and 2500rpm in second gear allow the use of the unit for occasional or professional purposes. The speeds are adjusted electronically and all changes can be monitored on the convenient digital display. But the digital display serves many other purposes. 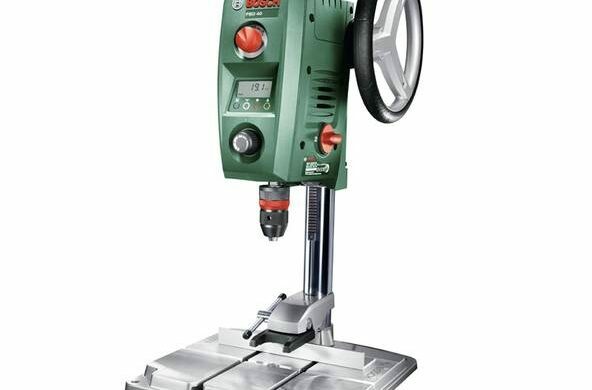 For instance, it allows you to monitor the level of drilling and achieve perfect holes on all workpieces. The unit also comes with an LED light and laser guide aids that further increase the precision. Engineered to cut holes up to 40mm through wood and up to 13mm through steel, this bench drill is compatible with a wide range of drill bits and accessories. As for the safety features, the unit has an ergonomic adjustment wheel with Softgrip, a quick-release clamp for the chuck, and an integrated V-groove that allow a safe fixing of the materials with a vice. If we were to identify any drawbacks of this product, size might be one of them. The unit measures 74.2×37.5x27cm and stands 65cm tall. Despite its size, the bench drill is lightweight and portable, weighing only 11kg. In terms of performance, Bosch PBD 40 is able to satisfy even the most demanding hobbyist while the lack of transmission belt revolutionises the product. Two gears and a powerful engine allow a quick and effortless drilling through different materials. 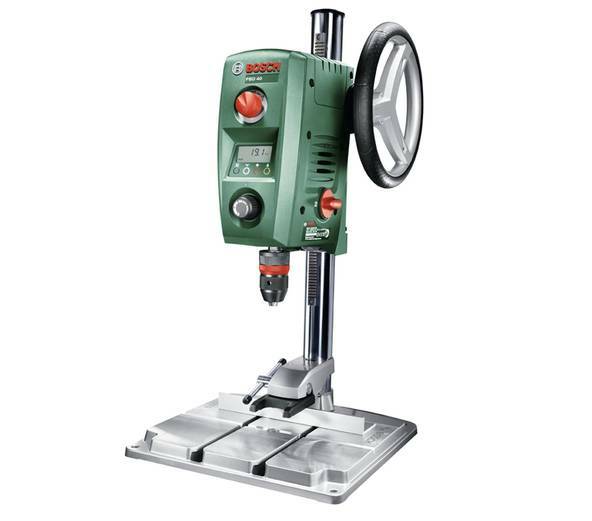 The convenient digital display allows an easy control of the speed, drilling level, and operations. Cutting series holes is easy thanks to the depth rod which allows a precise adjustment of the drilling depth. Precision is achieved thanks to the convenient LED light and laser guide. Undoubtedly, one of our favourite features. The price is hard to justify unless you need the product for frequent use. Advertised as a heavy-duty rotary pillar drill, Dirty Pro Tools™ 250mm 13mm is probably more of a hobby machine. However, this doesn’t mean it has a poor performance or scarce quality. The unit has a solid cast iron base; it comes with an adjustable milled table and it is powerful enough to drill through wood, metal, and plastic. Dirty Pro Tools™ is equipped with a 350W motor, it has a safety telescopic chuck guard and boasts 5 drilling speeds. The 13mm drill capacity is generous while the unit also has a swing of 290mm. Compact and lightweight, this machine could be a great addition to a home workshop. Its footprint is 16x16cm, and it has an overall height of 58cm. Weighing 18kg, the product is fairly easy to move if needed and easy to store. We liked the precision drilling system and the 50mm drilling depth, two features that make this device ideal for DIY projects. On the other hand, safety is ensured by protection guards and by a sturdy motor housing made of aluminium. On the downside, although the unit is easy to assemble, it comes with in-comprehensive and hard to follow instructions. Moreover, the drill press doesn’t have a safety interlock on the belt cover. This bench drill has a reasonable price, yet it can easily compete in terms of features and performance with more advanced units. Dirty Pro Tools™ is well-made and it has a smooth and quiet operation; the low level of vibrations increases the comfort during use. A sturdy cast iron table with slots ensure stability while the pulleys and motor housing are made of painted aluminium. Variable chuck capacity between 1.5 and 13mm ensures suitability for a wide range of projects. The unit has five speeds varying between 600 and 2650rpm. The lack of a safety interlock switch on the belt makes it possible to run the unit with the belt exposed, raising the risk of injuries. On/off buttons have an awkward position. The instructions manual is poorly written and hard to understand. Silverline 262212 is a machine designed for drilling jobs that require high accuracy. The unit mounts vertically on a working bench and can drill holes in a wide range of materials. However, the unit is more of a DIY machine rather than a professional product and is not suitable to drill masonry material. The product is easy to assemble and also easy to use. 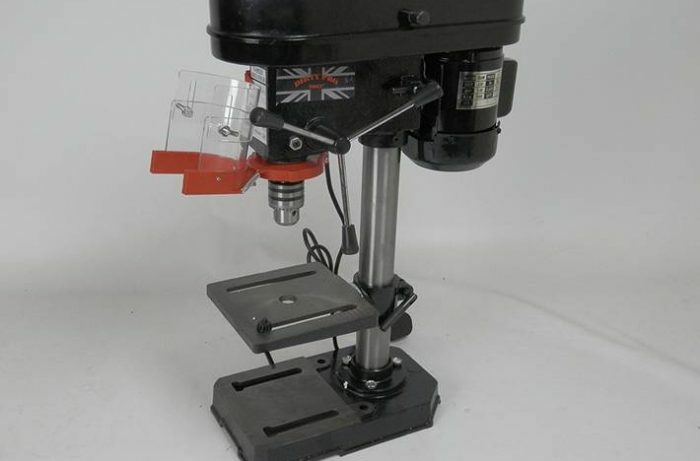 The keyed chuck adds versatility to the drill press and is easy to open or close, while the device is compatible with drill bits with shanks between 1.5mm and 13mm. This not only guarantees suitability for a wide range of purposes but also makes the unit fit to deal with many materials. Another thing we liked is the precise control of the depth, hole position, and angle entry into the workpiece – but also the capability to use the bench drill with a wide range of accessories. In fact, Silverline manufactures a full range of drill bits but also wire brushes, hole saws, and other compatible accessories. The bench drill is easy to operate. The drilling depth is easy to adjust by limiting the movement of the chuck, and it is possible to set is between 0 and 50mm. The unit is also equipped with a 5-speed belt drive that allows working with various materials. The machine comes disassembled but putting it together is easy and a detailed instruction manual provides all necessary information. The manufacturer recommends using Silverline 262212 for up to 15 minutes at a time and allowing it to cool down to room temperature before reassuming work. Used with the right drill bits, this machine can easily perforate hard wood, steel, brass, or thick plastic. A variable speed between 580rpm and 2650rpm ensures performance for all DIY projects. Comes with a sturdy cast base that fixes the unit in place. A compact footprint of 16x16cm allows the installation on a small workbench. Assembling the unit is simple, the instructions are straightforward and easy to follow, while the unit is also easy to operate. The product comes with a 3-year manufacturer’s warranty. Safety visor might interfere with the process and cause injuries. Hard to push on and off buttons. Plastic belt pulleys do look rather flimsy. 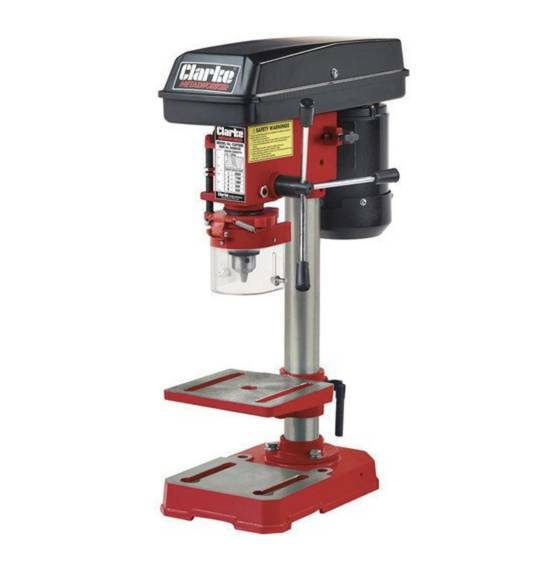 Clarke CDP5RB is a general-purpose bench drill ideal for hobbyist craftsmen and DIY enthusiasts. The product boasts five speeds, a 13mm capacity chuck and is powerful enough to drill accurate holes through wood, metal, and plastic. The unit is powered by a 350W motor and comes with an electrical cut-out on belt guard. This feature, together with the NVR/start-stop switch and the clear Perspex chuck guard, increases user safety. Moreover, a positive user experience is ensured by an array of other features. One feature we appreciate is the height adjustable tilting table with clamping slots that hold the material securely through the drilling process. Furthermore, a front-mounted reference chart allows an accurate depth measurement of each piece, ensuring a perfect match between the sections. The unit is also fairly lightweight and suitable to install on a working bench or table. The drill weighs 14.7kg, is easy to move as needed and it is also compact enough to occupy a little storage space in your workshop or shed. Another characteristic we like is the lack of play in the chuck. Admittedly, because the CDD5RB is only a hobby machine, we expected a slight movement of the material in the drill but were surprised to discover that there’s no play. It’s possible to drill holes with extreme accuracy for all projects. Five speeds varying between 620rpm and 2620rpm allow for accurate drilling through hard wood, metal, and plastic. 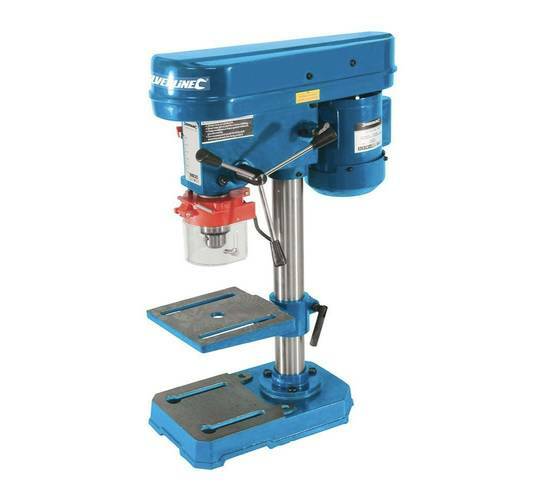 Compact dimensions make this bench drill ideal for most home workshops. The product measures 10.4cm from chuck to column, 16.7cm from chuck to table, and it has an overall height of 58.6cm. The unit weighs 14.7kg; it is heavy enough to boast a great stability yet lightweight enough to move or store easily. A clear Perspex chuck guard, a no voltage-release switch and an electrical cut-out on belt guard ensure user safety. Clarke CDP5RB is a hobby machine suitable for light-duty use; it doesn’t have the drilling precision of a professional unit. Some plastic components look a little flimsy. 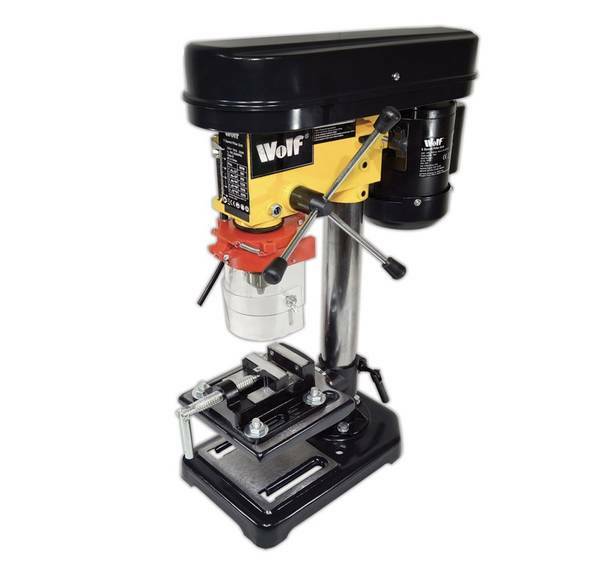 Wolf Engineer’s bench pillar drill is similar to the other machines tested, but a detail sets it apart from the competition. This unit comes complete with a 2½” all steel engineer’s vice, a handy detail that will save you the hassle of finding a compatible accessory. In terms of performance, the unit is ideal for occasional use and it is powered by a 350W motor. The machine is fully adjustable, from the tilt of the table to speeds and hole size. 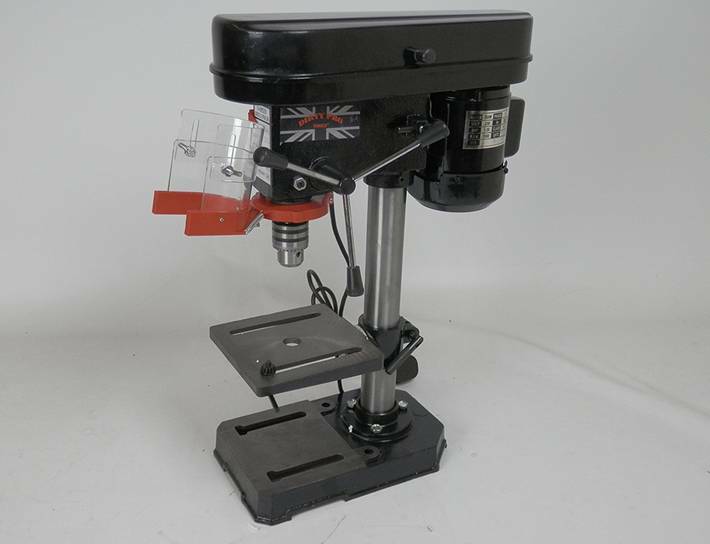 The table has a left and right tilt between 0 and 45°, it has five adjustable speed settings varying between 580 and 2650rpm, a max drilling depth of 50mm and is compatible with drill bits between 1.5 and 13mm. As for the make, the unit is engineered in high-quality cast iron and can be secured to most permanent types of workbenches for an accurate, reliable, and easy control. Regarding the size, this machine is slightly larger than the other units tested which could be an advantage but also a drawback. However, the footprint of 18.5x30cm is still rather compact. The overall height of the unit is 57.5cm and the machine weighs 12kg. We appreciated that this machine comes complete with a 2½” all steel engineer’s vice. Fitted Depth Stop Control is a feature that allows drilling perfect holes in all pieces. Assembling the unit is easy, it takes less than half an hour and the box includes detailed and accurate instructions. Various pulley combinations allow an easy changing of the speeds. The other features are also easy to adjust. The stickers applied on the unit peel off easily, giving the impression of a poor-quality product. There is a little play in the chuck, which makes precision drilling difficult. Overall, this still makes for a great hobby machine though. A pillar drill is an electrically run machine composed of a stable base, a column with a sliding table and a motor and drive system. The motor, drive system, and chuck are attached to the top end of the column, while the base, usually made of cast iron or other heavy material, is fixed to the workbench with bolts. The base may also act as support for larger workpieces while the table usually has diagonal slots and grooves used to fix an engineer’s vice. While most hobby machines don’t come with a vice, some manufacturers include one in the box. Yet, what most pillar drills do have is a tilting table which allows drilling at an angle other than simply 90°. A rack or hydraulic mechanism moves the table up and down on the column to accommodate workpieces of various sizes. On the high-end models, the table might also have grooves around the edge to drain the coolant. One of the most important parts is the motor and drive system, responsible for spinning the chuck and changing the drilling speed. Most amateur pillar drills come with a drive belt while the professional machines are typically equipped with a system of gears. Moreover, the light-duty machines are associated with manual feed, while the better performing machines boast power-feed. The chuck, or spindle, is a rotating shaft operated by the motor. The rotating power is determined by the power of the motor and we found that a wattage between 350W and 700W is sufficient for DIY projects. Professional units, however, rarely have a motor under 700W. Almost all bench drills available on the market also have an adjustable chuck compatible with a range of drill bits and cutting accessories. This is something to consider if you want to use the machine for work other than drilling. Another essential element is the column, comprising a supporting tube made of steel. The most important feature of the column is the rigidity, an essential detail if you want to achieve precise holes, but also important to reduce the level of vibrations which will ultimately define your user experience. The bench drills are manoeuvred by an operator, they are turned on and off from a switch. Most drills will have a safety locking mechanism that stops the unit if it’s overheated or in the case of power fluctuations. Power, compatible accessories, and size of the machine determine what a pillar drill can or can’t cut through. Most light duty units available on the market are compatible with drill bits between 1.5mm and 13mm, and some of them can even cut holes up to 40mm, depending on the material. Almost all hobby machines can cut through wood. Most bench drills are compatible with classic vertical drills and hole saws able to bore through all types of wood, including hardwood. Moreover, some units are even compatible with accessories such as sanding cylinders or circular saws. Light duty pillar drills can cut through thin metals and some perform well when drilling brass or steel. However, most hobby machines are not powerful enough to cut through tough metals such as iron. When working with metals, pay attention to make sure you’re choosing the right drill bits. Plastic is a rather weak material meaning you should be able to cut through it with a light duty machine. Some types of plastic, such as cast resins, may pose a higher resistance but in most cases, drilling through these materials is easy with the right accessories. Pillar drills are rarely suitable to cut through masonry. Although some machines could drill holes through concrete, cement or building stones, we wouldn’t recommend it. You’re likely to cause significant cracking and other damage. Manufacturer’s instructions usually include a list of materials you can drill through with a specific model and we would always suggest following them. Before turning on the device, check the condition of the power cord and socket. This will help identify any faults and keep electrical risks to a minimum. Always wear safety equipment when performing drilling works. Goggles are indispensable and should be worn even if the machine comes with integrated safety guards. It is crucial to use a suitable drill bit at all times. Boring holes with an incompatible drill bit is one of the most frequent causes of injuries. Never hold the workpiece with your hands but fix it on a vice. This will minimise the risk of injuries. Ensure the chuck is secured properly before operating the unit. A loose clamp may cause disruptions in the drilling process which could result in injury. Avoid touching the drill bit before it has stopped spinning. Equally, don’t touch any material residues immediately after drilling, as they may be extremely hot. Use the bench drill at the recommended speed only. Too low a speed could burn the motor while a too high speed could turn the drilling device into an uncontrollable machine. Dust and noise are bad for your health. To minimise risks, work in a ventilated environment and use protective earmuffs if the drill press is noisy. Always use a face mask to prevent the inhalation of dust. Always keep the guard on the spindle pulley to avoid your clothes or hair getting caught. Also, avoid wearing loose clothes, gloves or jewellery when operating a drill press. It may sound obvious, but never stop the device by grabbing the drill after the power is off. Moreover, make sure the unit has completely stopped before leaving it unattended. Happy drilling!